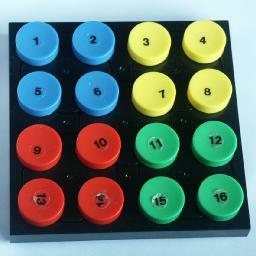 This simple puzzle has numbered and coloured pieces arranged in a 4×4 square. The pieces can be mixed up by rotating a 2×2 sub-square of pieces - either a corner square or the centre square. The aim is of course to unscramble the pieces, restoring the starting position. It is also possible to ignore the numbers and just make a particular arrangement of the colours. The original version of Gripple was marketed by M-Squared Inc. in 1989. There are 4 colours, with four pieces of each. In the solved position, the four pieces of a colour are together in a 2x2 square. A sheet of numbered stickers was supplied with it so that the pieces could be numbered 1 to 16 in any manner you wanted. In Taiwan this puzzle was also made with numbers printed onto the pieces. Gripple was invented by Murray J. Gould, and patented on 5 April 1988, US 4,735,417. There is also a Bulgarian version of the puzzle, shown in the second picture above, which is called Colour Spectre, or Gamma. It has 5 knobs on the back of the puzzle with which you turn the sub-squares of pieces. The pieces are encased in a frame with 16 holes that allow the numbers to be seen. Most commonly it has four colours of pieces, four pieces of each colour that are numbered 1 to 4. There are also versions where all the pieces are the same colour and numbered 1 to 16. It comes in many different colour combinations. There are 16 pieces, so these can be arranged in at most 16! ways, and in fact all these can in fact be reached. The orientation of the pieces is completely determined by their position, so there are 16! = 20,922,789,888,000 possible positions. Note however that there is more than one solution, as the puzzle can be solved in any of the four orientations, so there are 4 solutions. Furthermore in the Bulgarian version, the 4 colours can be arranged in 4! ways in the solution, which means that is has 4·4! = 96 solutions. Java Gripple (without numbers) with built-in solver. In the solution below I will only need to use a notation for the top left corner square and the middle square. Call a clockwise twist (when looking at the front of the puzzle) of the top left corner C, a half turn is then C2, and a counter-clockwise turn is C3. Similarly moves of the middle square are called M, M2, and M3. Phase 1: Solve the three edge pieces of the top left square. 1. Find the piece belonging at the top left corner of the top left square. 2. If it is not somewhere in the middle square, then you can always make a single move to bring it to the middle. 3. Turn the middle square to bring the piece into the top left square. 4. Turn the top left square to put the piece into position at the top left. 1. Find the piece belonging at the top right corner of the top left square. 2. If it lies at the bottom left of the top left square then C3 M C2 M3 C3 will solve it. 3. If it is not somewhere in the middle square, then you can always make a single move to bring it to the middle. 4. Turn the middle square to bring the piece into the bottom right square. 5. Do C M2 C3 to put the piece into position. 1. Find the piece belonging at the bottom left corner of the top left square. 3. Turn the middle square to bring the piece into the bottom right square. 4. Do C M2 C3 to put the piece into position. Phase 2: Solve all the other edge pieces. The edge pieces of the other corners can be solved in the same way. 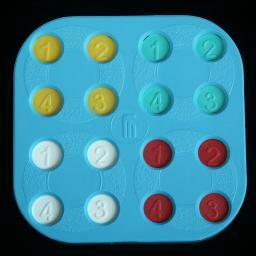 You can simply turn the whole puzzle so that an unsolved corner is at the top left and go through phase 1 to solve it. Do this for each corner. Phase 3: Solve the centre. Turn the centre so that at least two of its pieces are correct. To swap two adjacent pieces in the centre, hold the puzzle so that the two pieces to be swapped are at the top of the centre square, and do C M2 C3 M3 C M3 C3 M3. To swap two non-adjacent pieces in the centre, hold the puzzle so that the two pieces to be swapped are at the top left and bottom right of the centre square, and then do M C M3 C3 M C M C3 M C M3 C3 M. Alternatively you can simply perform the sequence in step b above to swap any two adjacent middle pieces, and then you will find that you have to swap two other adjacent ones to solve it.